DORTMUND — Spain international Marc Bartra was injured in the explosion which hit the Borussia Dortmund team bus on Tuesday and saw their Champions League game against Monaco called off, the club confirmed. The 26-year-old centre-back injured his hand and was taken to hospital for treatment, said Dortmund’s CEO Hans-Joachim Watzke. The quarter-final first leg was rescheduled for 18:45 local time (16:45 GMT) on Wednesday. "There has been an attack with explosives on the team bus," said Watzke. "The whole team is in a state of shock, you can’t get pictures like that out of your head. 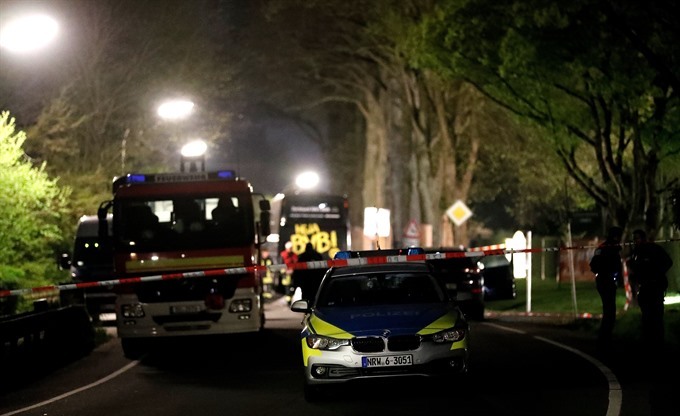 The explosions came shortly after 19:00 local time on Wittbraeucker Strasse, around ten kilometres (6 miles) from the Dortmund stadium Signal Iduna Park. According to the police, three explosive devices were detonated near the team bus while it was en route. Several of the vehicles’ window panes were broken. In the aftermath of the explosions, the Dortmund team was taken back to the team hotel. "For security reasons, we do not want to announce the next steps in the procedure," added Watzke. With the 80,000-capacity stadium filling up just before the scheduled kick-off time, fans were told to stay in the ground until police signalled it was safe for them to leave. "All our support for Marc Bartra, BVB and all their fans," tweeted Barcelona, Bartra’s former club, before their Champions League quarter-final against Juventus on Tuesday. An attack of this nature is unpredecented in German club football. The national team, which included some current Dortmund players, was involved in the terror attack in the November 13 terror attacks on Paris in 2015. The German team spent the night at the Stade de France, on police advice, following their friendly defeat to hosts France and flew home the next morning.